(CascoSpanish.com) Located in the heart Panama‘s Old Quarter, Casco Antiguo Spanish School provides authentic cultural and language immersion experiences. Our private, and small-group Spanish classes give you practical real world language skills, so you can stop studying and start speaking. Whether you’re living and working in Panama, or just passing through, we have Spanish classes to fit your needs and budget. Casco Antiguo Spanish School‘s 1 on 1 and small group Spanish classes provide real world language skills, allowing you to put down the textbook and experience Panama first-hand. Our professional and friendly teachers have a passion for education and make learning Spanish fun. Let Casco Antiguo Spanish School be your guide to Panama, and live the experience of a lifetime! We offer a “Survival Spanish” Course for Expats, Crash Course for Travels, private lessons, Intensive Courses, and business Spanish. 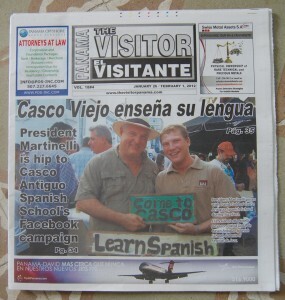 Whether you’re visiting, working, or retiring in Panama, Casco Antiguo Spanish School can help you learn Spanish.